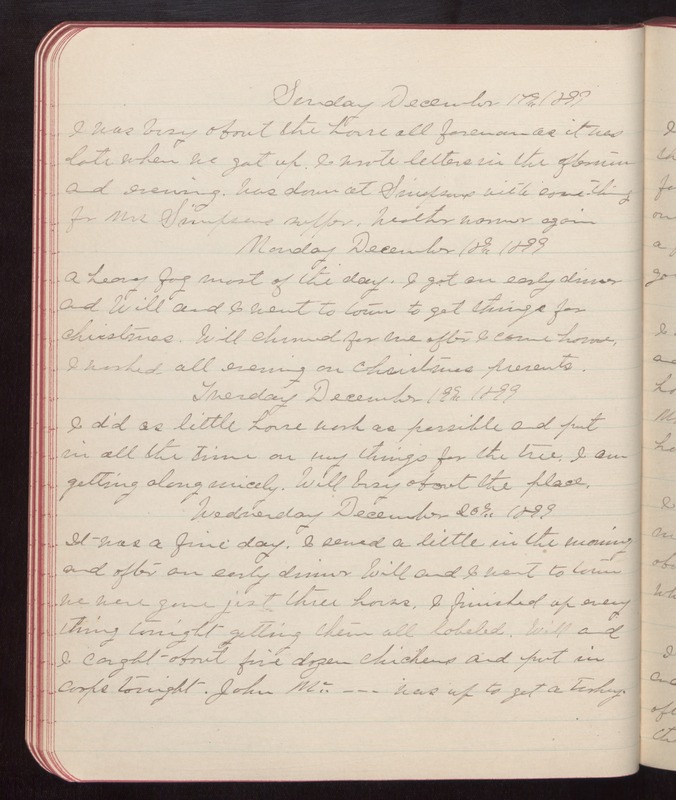 Sunday December 17th 1899 I was busy about the house all forenoon as it was late when we got up. I wrote letters in the afternoon and evening. Was down at Simpsons with some-thing for Mrs Simpsons supper. Weather warmer again Monday December 18th 1899 A heavy fog most of the day. I got an early dinner and Will and I went to town to get things for Christmas. Will churned for me after I came home. I worked all evening on Christmas presents. Tuesday December 19th 1899 I did as little house work as possible and put in all the time on my things for the tree. I am getting along nicely. Will busy about the place. Wednesday December 20th 1899 It was a fine day. I sewed a little in the morning and after an early dinner Will and I went to town We were gone just three hours. I finished up every thing tonight getting them all labeled. Will and I caught about five dozen chickens and put in coops tonight. John Mc.___ was up to get a turkey.